TPG Real Estate, the dedicated real estate platform of global alternative asset firm TPG, and Round Hill Capital (“Round Hill”), a leading real estate investment, development and asset management firm, today announce that they have acquired, through a new joint venture (the “Joint Venture”), a site comprising approximately 39,000 sqm of buildable area in central Lisbon, Portugal. TPG Real Estate and Round Hill intend to develop high-quality, purpose-built student accommodation and residential apartments on the site. Financial terms of the transaction were not disclosed. The acquisition marks TPG Real Estate and Round Hill’s first joint transaction in Portugal, a country which exhibits positive investment fundamentals, a housing demand/supply imbalance, and robust economic performance. TPG Real Estate and Round Hill have been evaluating the real estate market in Portugal for several years and are continuing to target further investments in Portugal, in line with the Joint Venture’s investment strategy. 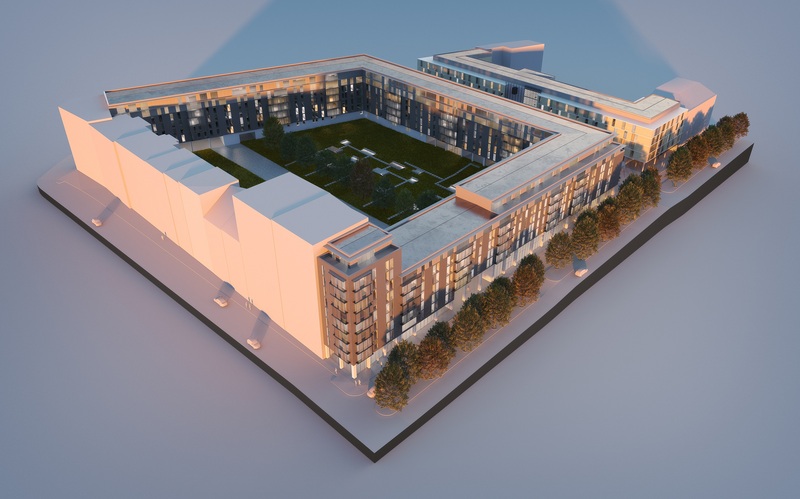 Situated at Campo Pequeno in central Lisbon, the development will provide 390 purpose-built student accommodation beds and up to 250 residential apartments. The plans also provide for dedicated amenities and common areas for the students, as well as shared commercial space for all residents. Campo Pequeno is an established residential area that benefits from extensive neighbouring facilities and excellent transport links. The site is a short walk to the University of Lisbon central campus and other local universities, colleges and business schools, with easy access to the city’s historic centre and Lisbon Airport. On completion of construction, the student accommodation will be managed by Nido Student, Round Hill’s established operational platform and brand for European student accommodation. Nido Student acts for Round Hill advised and third-party capital partners across Europe. “The acquisition of the development asset at Campo Pequeno is TPG Real Estate and Round Hill’s first joint transaction in Portugal and Round Hill remains committed to continuing to look to make further investments in student housing and residential property in line with our existing strategy and growth plans in the country and in other select European markets. TPG Real Estate (“TPGRE”) is the real estate platform of TPG, a leading global alternative asset firm with more than $94 billion of assets under management and 16 offices around the world. TPGRE includes TPG Real Estate Partners (“TREP”), its equity investment platform, and TPG Real Estate Finance Trust (NYSE: TRTX), its debt origination and acquisition platform. TREP focuses primarily on investments in real estate-rich companies, property portfolios, and select single assets located in North America and Europe. TRTX originates and acquires senior real estate loans across a broad spectrum of asset classes in North America. TPGRE currently manages approximately $7 billion in assets across both platforms. For more information please visit www.tpg.com. Round Hill Capital is a highly focused investor and is experienced in establishing and running first class operating companies, having invested more than €7 billion of capital in real estate assets since its inception in 2002. Round Hill has a successful track record of investing in and operating residential and student accommodation assets across Europe. The Group has acquired, built and managed over 110,000 residential units and student housing beds in recent years and currently manages circa 65,000 residential/student homes in eight European countries. Round Hill’s approach incorporates multiple strategies, including acquiring existing assets, developing new purpose-built assets, forward-purchasing assets and repositioning assets.